Hello, Guys hope you are good. I'm going to talk Most Important topic about Adsense approval right in this post. So read and follow carefully. What is AdSense and How it works? Google Adsense is one of the most well-known advertising platforms and for a good reason Approval of Adsense is very difficult if you do not know all the rules of Adsense. Not everyone gets so easily approval of Adsense. 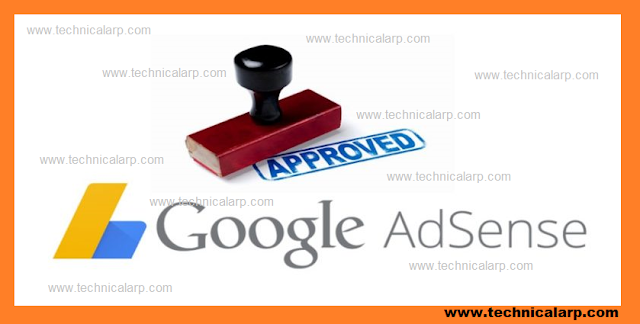 If you also want to get the approval of Adsense, then you will have to follow the full rule of Adsense. I am going to tell you about the questions that people carry on with their Approval problem. So let me tell you what you have to do to get Adsense approval. A step by step guide to get approved. Google wants to run away from unwanted or incomplete content, or generally bad content websites. This is the reason that if there is no content on your website, or if the content is less quality or inappropriate, then you will automatically reject it. If your blog is new and just started your blogging, then you put 15 to 20 (very Imp )posts on it before applied AdSense. Each post should be 500 words or more, otherwise, you will not get the AdSense approval. As your site also get visited from mobile and other devices so it is good practice to use Responsive Template on your site. If your blog is not responsible for the design, then you will not be able to display any mobile device ads properly. After getting a responsive site. You can apply your ads on Google ads to a clean and simple responsive template. When you apply for AdSense, first you have to remove the other ad network from your blog. If you are also connected to another ad network and looking for Adsense, you must first remove it from other networks. And then Apply for Google Adsense. If your blog has a copyright image or has a copyrighted content then you have to delete with it first. Copyright image or copyrighted content is against Google Privacy, then you have to delete it first. Use of duplicate content Your traffic goes down on your blog, it knows everything. The policy of AdSense is against duplicate content. If you want to be a blogger then you should be 18+. Google's privacy does not allow under 18 people to work on the blog. Linking your blog to a social site will increase your visitors to your blog. The more engagement your blog has on social networks, the more your blog will be considered as Genuine. If you used any template that contains many social media profiles(Gadgets/Widget) like Facebook, Google Plus, Linkedin, Pinterest, YouTube etc, then complete all profile links or remove unwanted profile links. Follow all these Steps and then Apply to Google AdSense and you will get Approval Just in 1 day Appro.